San Simon is an archipelago made up of four separate islands and it is found in the ria (bay) of Vigo to the south of Galicia. Although small in stature, this collection of islands have seen more than their far share of history and they have had a documented human population for over fifteen hundred years. communities. At that time the attraction of these islands was obviously peace and solitude, but all of this changed when Sir Francis Drake's privateering activities of the sixteenth century started to impact on these religious communities. The appeal of this part of Spain to Drake was its closeness to England and the ease with which it was possible to make a raid and then escape to open sea. As the level of raids and plunder increased and Drake's activities expanded, many of the inhabitants chose to escape to the safety of the Spanish mainland leaving the islands more sparsely inhabited. Another landmark snippet of history occurred around the San Simon archipelago in 1702 when the Batalla de Rande took place (a see battle). Also known as the battle of Vigo, this was one of many battles that are considered to be a part of the War of Spanish Succession during the early part of the eighteenth century. In the twentieth century the islands again became one of the important outposts of Spain when a quarantine station was set up at San Simon, primarily to monitor passengers travelling by ship from the Americas. 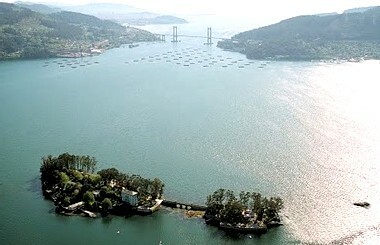 Today much of the port of Vigo's success and development is credited to the establishment of this outpost which ultimately led to Vigo being the most prosperous city in Galicia. Perhaps the least pleasant event in San Simon's history took place in the twentieth century during the Spanish Civil War. This was a war that turned brother against brother and father against son as the socialist and fascist factions battled for a new order that would re-shape Spain. During this time the islands became a prison island, much like Alcatraz, and its prison was reputed to hold as many as two thousand prisoners at any one time. As history has made past events more clear, it has become obvious that this prison was the site of mass torture and execution and that conditions were literally un-liveable. This scar remains in Spanish memories even now and it is perhaps the reason why these islands have been overlooked as a tourist opportunity. Ironically and somewhat unpleasantly the islands of San Simon would, only a short time later, have a new use as summer residence for some of Franco's elite guard. This was however short lived and various applications were given to the islands between then and the point where the islands were ultimately vacated. They remain in a semi abandoned state, even though they are clearly visible from the mainland. Over more recent years there have been many plans for these islands. Their location, in the best climate in Galicia, along with panoramic views in to and out of the bay would appear to make them an ideal vacation spot, but past history makes such a decision difficult. As things stand, San Simon is a mini tourist haven waiting to happen, but as yet the hotels and visitor centres have still to be built.